Description: Dams provide hydroelectric power and recreation to much of the Pacific Northwest. However these dams block the normal migration of salmon upstream to spawn. Whoosh Systems has created a "salmon cannon" that may the problem of salmon migration. Salmon are moved up a vacuum tube and launched into the water above the dam. 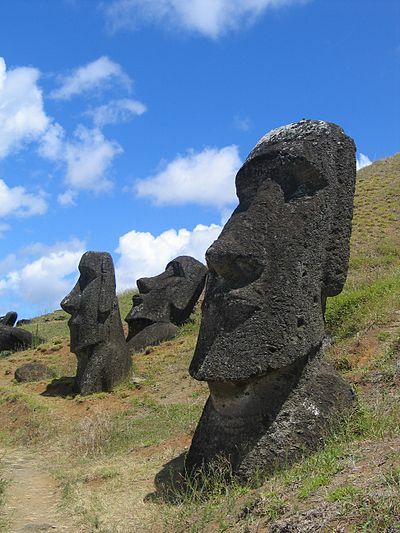 Description: The island of Rapa Nui once supported a large community of Polynesians that are best known for the massive statues (moai) pictured below. However when sailors arrived on the island in the 18th century the people were barely hanging on. What is not pictured below are any trees. Deforestation led to the collapse of this culture.